A few years ago we attended a Petroville holiday gathering. I met so many people it was a blur of faces and, I am sorry to say, of names as well. We were corraling a ten-month old between the kitchen and the dining room where he couldn’t break anything and chatted with folks as they moved between rooms. I had little brain energy left to keep up with the names to faces and felt badly that I know I called at least two people by the wrong names. 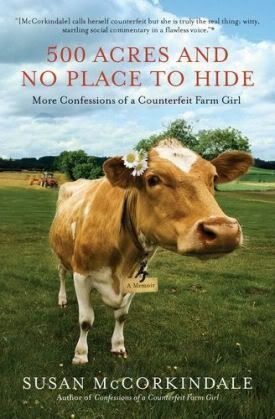 Later, much later, I put two and two together and realized she was the Susan who was being published soon with a new book Confessions of a Counterfeit Farm Girl. When the book came out I read it in one sitting. If you haven’t read it you need to. (I would suggest reading before her newest book launches.) Susan is a city girl from Jersey, former marketing exec with Family Circle magazine, who lets her husband convince her to give it all up for a quiet little life on a farm in Virginia. You’ll laugh at her wit, become charmed at her twist of words and love the way she loves her McMen. Jump forward to earlier this year when I was asked by Kim to review Susan’s newest book, 500 Acres and No Place to Hide, I eagerly said yes! and then waited with itching hands to actually get a copy and dive in. My book arrived two weeks early and I dove in head first ready to start laughing. That evening I stood at the stove and stirred with one hand and one eye on the food. The other hand was gripping 500 Acres and No Place To Hide. While the right hand was cooking the left eye was relishing in the mental food of a great read. I couldn’t put it down and finished all but the final three chapters the following morning. Due to animals, kids, guests and errands I had to wait until that evening to read those last three chapters. It was past midnight and I was glued to the sofa, alone in the living room with a lamp on while the rest of my house slept. As I read the last line in the book I started to cry. I wept for her, for her children and for her husband. I went to bed with sniffles. The haunting sadness of her loss was only buffered by the dark comedy not only from herself but from her husband as well in reaction to his illness. Laughter in the face of tears is good medicine. Susan writes with a clear voice filled with love and affection and you can’t help but want to give her a hug then sit down and chat with a bottle of wine or two -and maybe some canapes. Susan has the ability to be silly, funny, poignant and heart breaking all at the same time. Her journey begins like a modern Green Acres wherein she plays the role of Lisa Douglas expertly. Counterfeit? No, no, no. Susan is the real thing. A real life Farm Girl hidden under the guise of being a Jersey Girl. She is a master at playing on words. I am very sure in another life her dog, Tug, was actually Arnold, the pig. Susan also has a great sense of humor. When all of her chickens go to chicken heaven (her oven and a big cook pot) I’ll offer her some from own flock. She’s sure to love them as they are as tasty as the ones she is raising. Susan uses her talent to unravel the inner workings of her relationship with her husband, ‘Hemingway‘, and tosses in some black comedy to soften the brunt of their inevitable loss and drags you along for an incredible ride through her life in the mud, and the bugs and the deer* found on the farm. Hang on to your hats because when Susan is in the driver’s seat she stomps the gas with her louboutin’s and you’re flying through the Virginia countryside in a whirlwind of fun. Susan will be at Salon Emage Day Spa this evening (Aug. 1st) for the launch of her newest memoir 500 Acres and No Place to Hide. If you are local please do drop in. You’ll love meeting her. You will also be able to buy a copy of her book which is not on sale any place else until tomorrow. *Sorry, Shel Silverstein, I was caught up in Susan’s style and it is my own little attempt to play on words. Have you read about the new Samsung LCD refrigerator with apps? Head over to my review blog and leave your comments for a chance to win a $100 Best Buy gift card! Oooh, I’m so excited her new book is out. The last one was excellent and I’m really looking forward to this one. LOVE THIS!!! Ang, I adore you. Angie, Wonderful review of a wonderful author and woman. You done good:) I can’t wait to get my copy, Loved Susan’s first book and you expressed my sediments exactly. I don’t know how I missed the first one, but it sounds right up my alley. Perfect timing as I do need a book (or two) to read. Just desire to say your article is as astounding. The clearness in your post is just nice and i can assume you’re an expert on this subject. Fine with your permission allow me to grab your feed to keep up to date with forthcoming post. Thanks a million and please carry on the gratifying work.